A Hubble Space Telescope observation of the star Eta Carinae, made with the Wide Field and Planetary Camera (WF/PC). An eruptive variable star, Eta Carinae has expelled a large amount of gas into the surrounding interstellar medium. The HST resolves individual clumps as small as only about ten times the size of our Solar System. Because it is clumpy on such small scales, and has such a well defined edge, the nebula is probably a thin and well defined shell of material, rather than a filled volume. 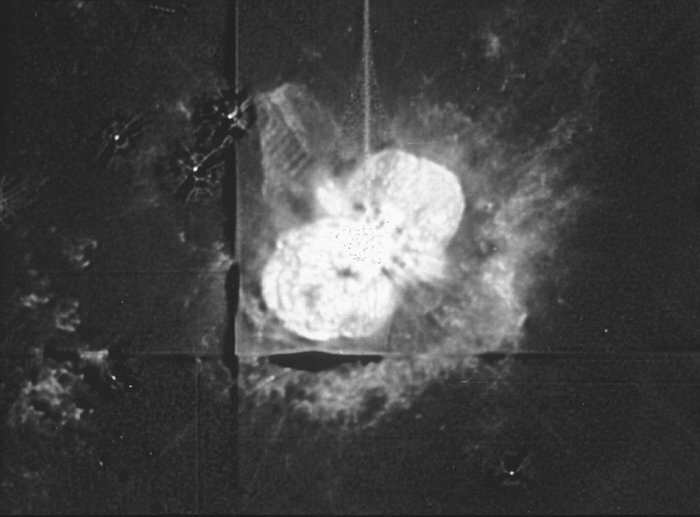 Radiation pressure and stellar wind from Eta Carinae have fragmented the shell. Ejecta from the star slams into slower moving gas to create a ridge of emission to the lower right. This ridge is in fact part of a "cap" of material located to the southwest and behind the star. Small knots and filaments trace the locations of other shock fronts within the nebula. Position (Dec): -59° 41' 1.28"